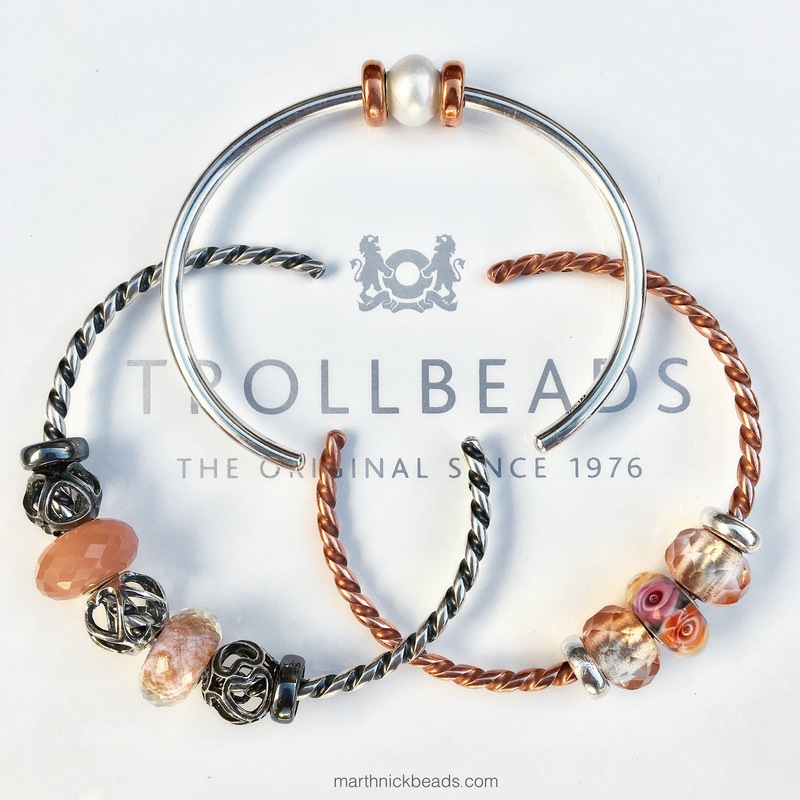 Roses for Mom and Opposites Attract are launching on Trollbeads.com (affiliate link) March, 3, 2017 and will cost $56 USD/ $64 CAN and $46 USD/ $53 CAN respectively. 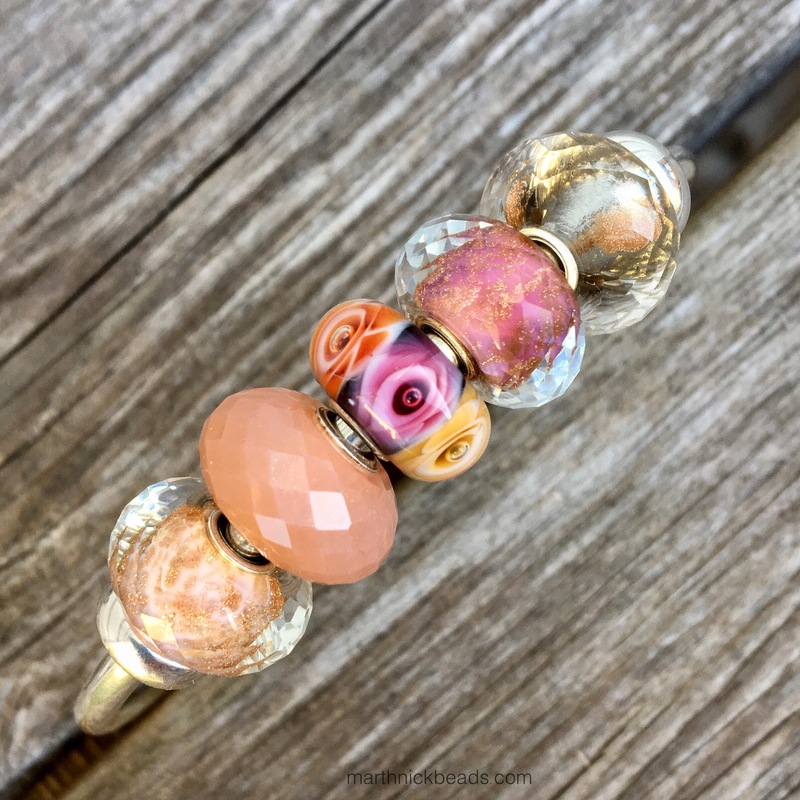 The glass bead is a limited edition release for Mother’s Day. It’s designed by Nozomi Kaji who also designed Deep Ocean. 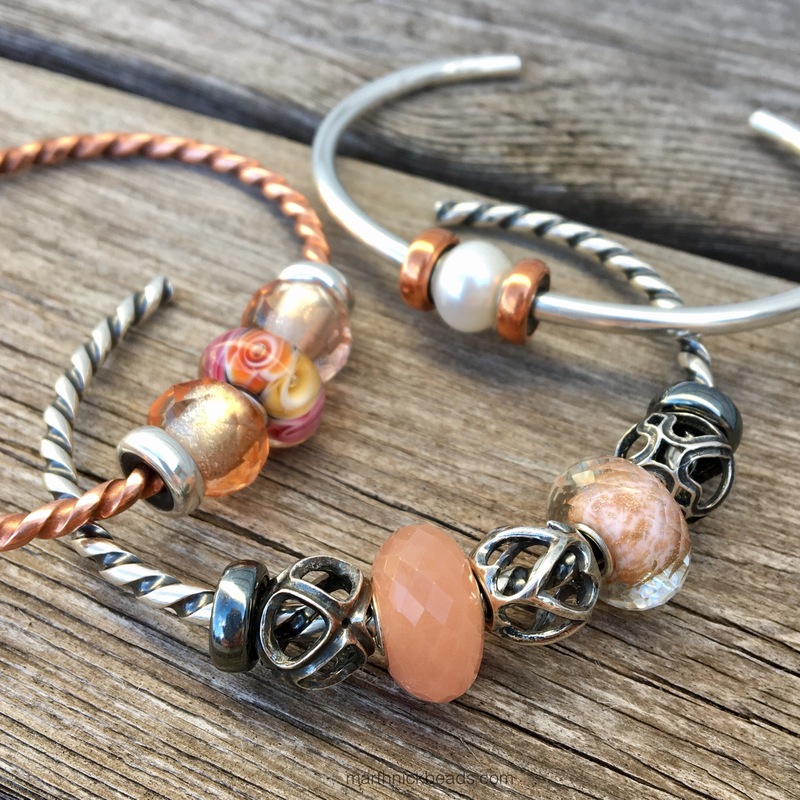 The silver bead is designed by Louise Rimpler who also designed the Mexican Sugar Skull Bead. I think it’s great how Trollbeads lets us know who designed their beads! 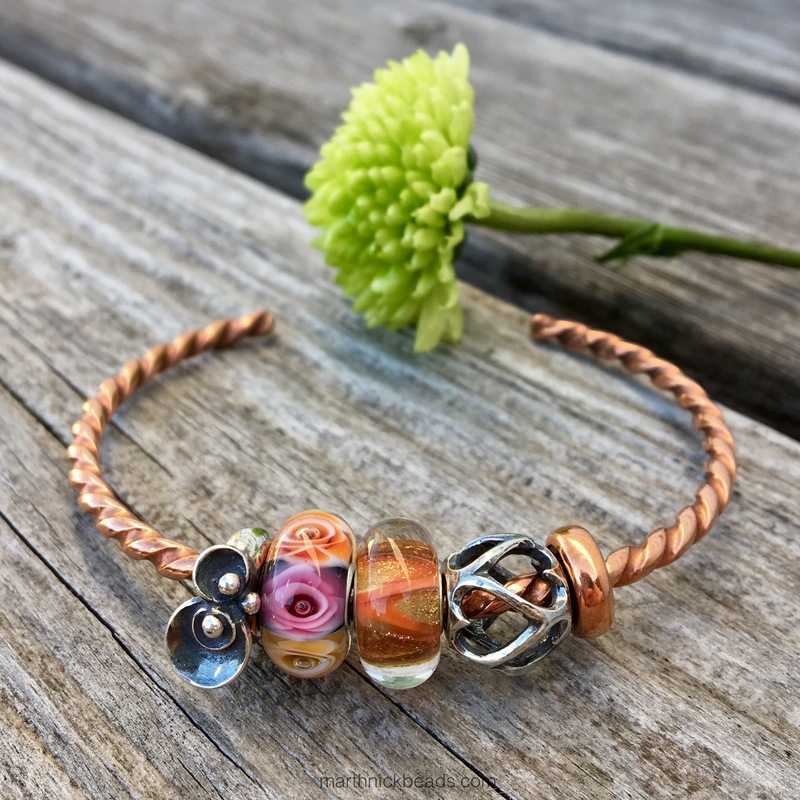 This bangle shows them the best, I think and I so love the Roses for Mom with copper and the Love & Laughter bead. Pretty much all my photos today are variations on a theme. I tried the Roses for Mom with a couple of black beads but it didn’t work for me. 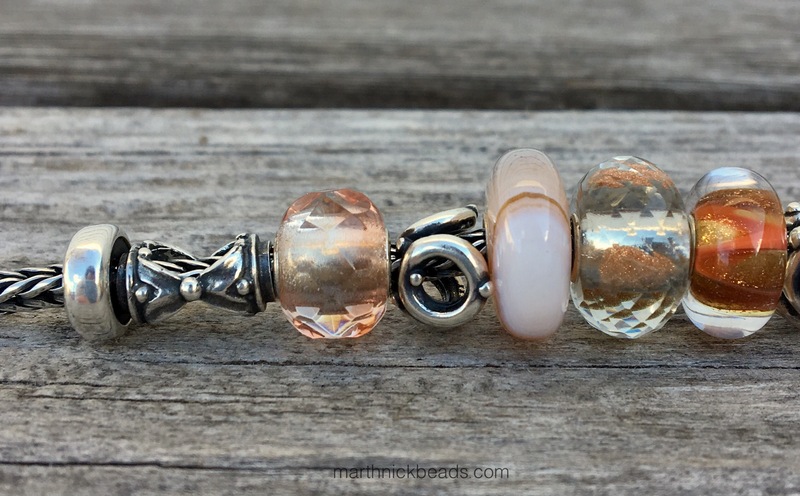 What I’ve enjoyed putting together are fairly simple combos using pinks and peaches. I think this is my favourite below because I really like how the White Pearl looks with the copper. Since the Rose for Mom has a lot going on in terms of colour I thought I’d try it with some beads that have fairly solid colours. 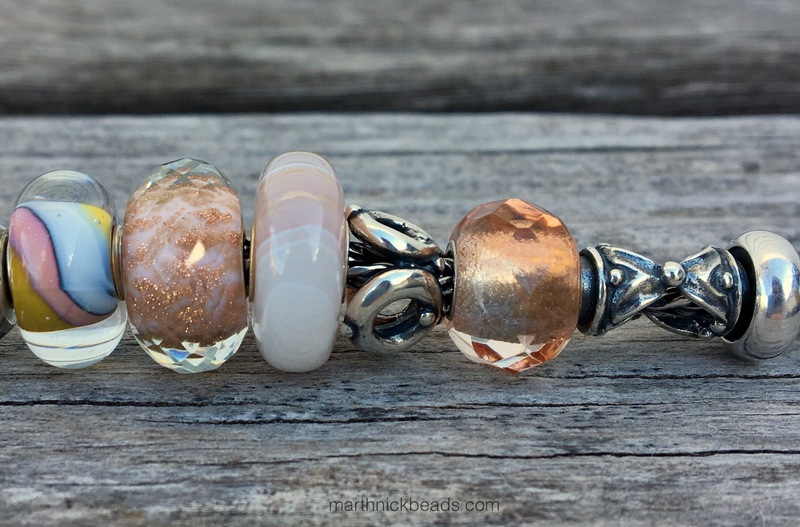 Left to right below are Blossom Shade, Feldspar Moonstone, Pink Delight Facet (which was last year’s Mother’s Day glass bead) and Daylight Brilliance. Another trio of bangles has the Roses for Mom with two Pink Prisms. Then, the Opposites Attract goes nicely with Rise Together and Symphony of Hearts. They are also in the open work style but more oxidized, so I threw on some oxidized spacers (stoppers) and the Feldspar Moonstone and Blossom Shade. Next, here is a full bracelet using some of my Pink Agate Striped beads. Below left to right are Hourglass, Pink Prism, Social Circle, Pink Striped Agate, Daylight Brilliance and Love & Laughter. Below left to right after Love & Laughter are Moonlight Dancing, Pink Striped Agate, Roses for Mom, Pink Striped Agate, Opposites Attract and Sweetness. Below left to right after Sweetness are Blossom Shade, another Pink Striped Agate, Social Circle, Pink Prism and Hourglass. 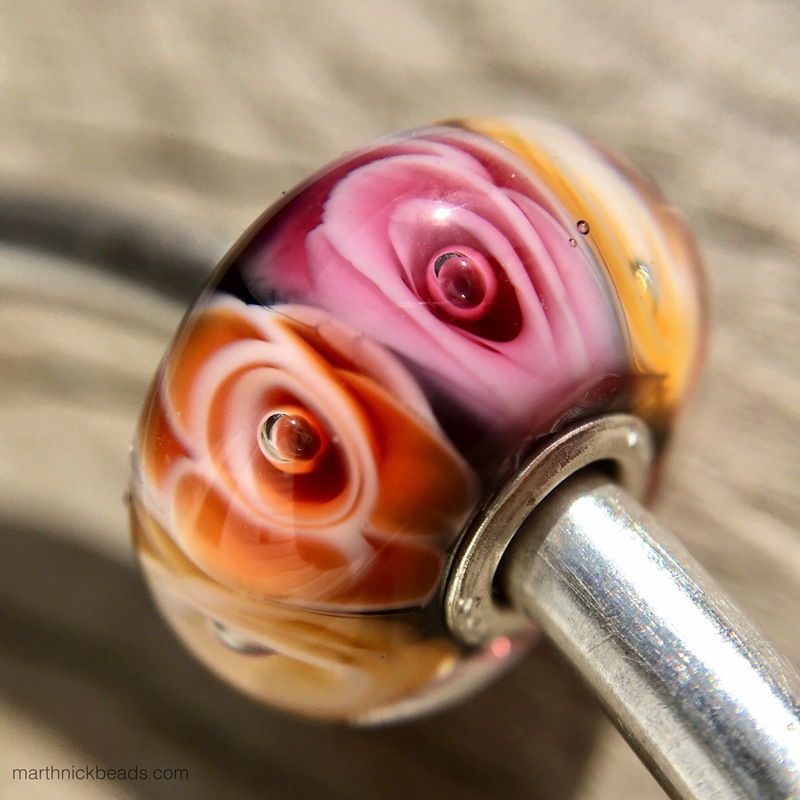 And just because I want to have all my Roses for Mom photos in one place, here is the macro shot and the one on the leather bracelet with all the Water Lily Spacers on a bangle. I had considered buying another Roses for Mom, but decided to keep it at one. 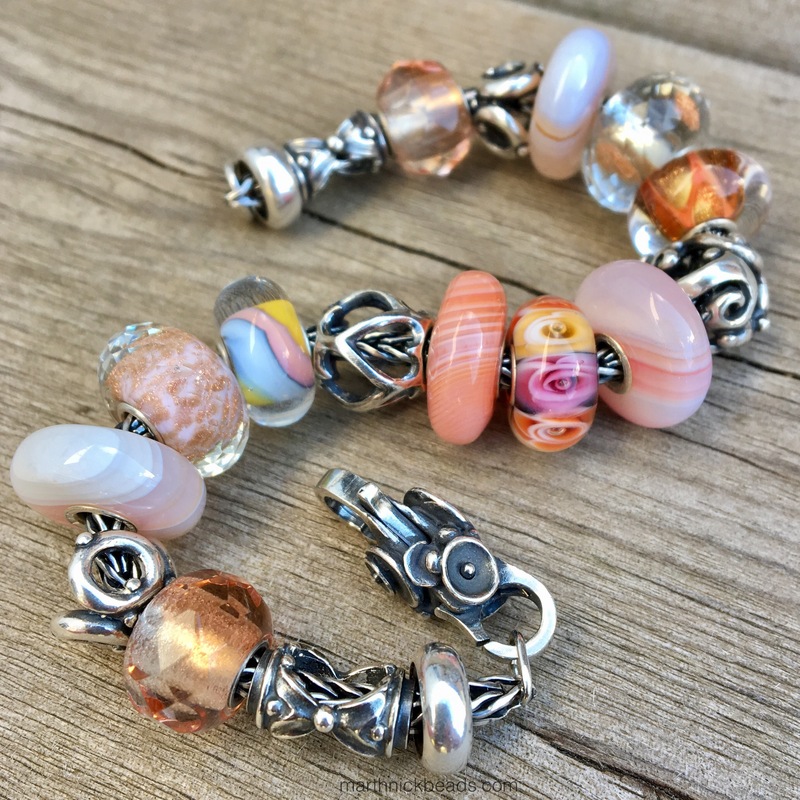 I love pink beads, so would rather have a variety of pink/peach beads to choose from to go with the Roses for Mom. 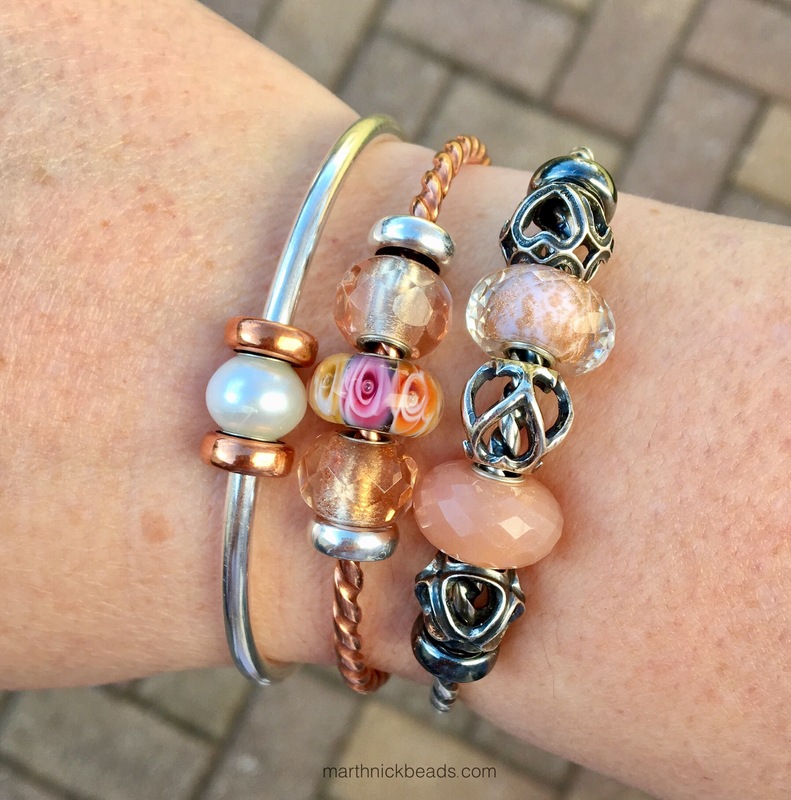 I have seen bracelets on Instagram though using multiples and they look lovely! I think the Opposites Attract bead is very graceful and lovely. If anyone wants to order a Roses for Mom and is having trouble finding one in stock, let me know and I’ll see if I can help track one down. 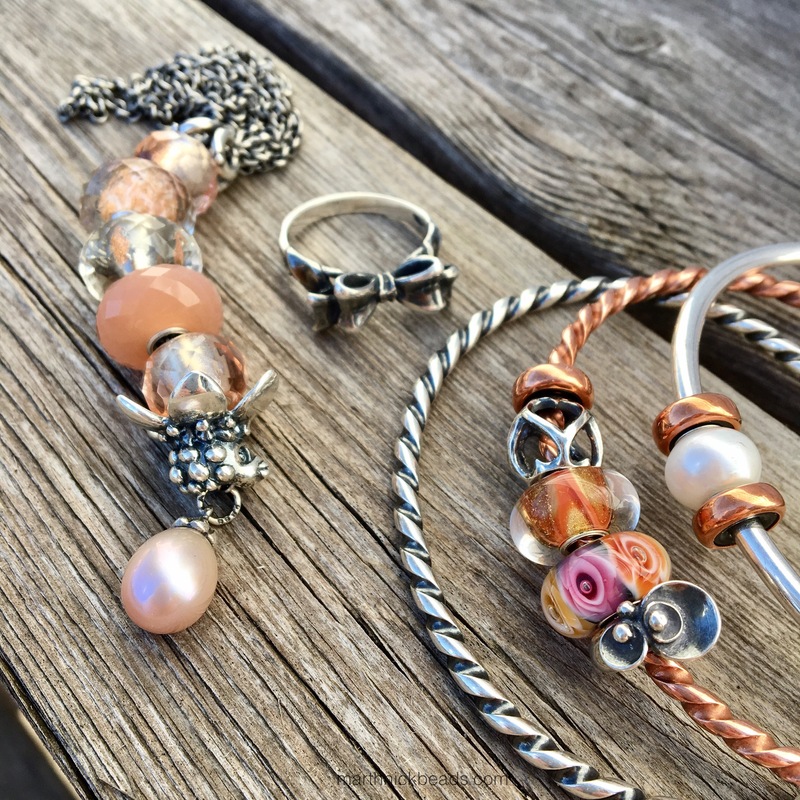 It looks like Perlen is already on back order, but it seems like Trollbeads USA and Canada have them and Blooming Boutique Beads is getting more today, I heard. Coming up next week will likely be Spirit Beads and True Beadz and then the week after will be some new Fenton Beads. Have a great weekend and do let me know if these beads are going on ‘the list’! J’espère que tu aimes Sylvie! Je viens de la recevoir mais je la trouve très difficile à accorder aux autres ! Je suis désolé, but I don’t quite understand. Google Translate is not helping me! Wait, I think you are saying it is difficult to use with other beads. Oui, c’est tres motif occupé. Hi Martha, Roses for Mom is definitely on the list. 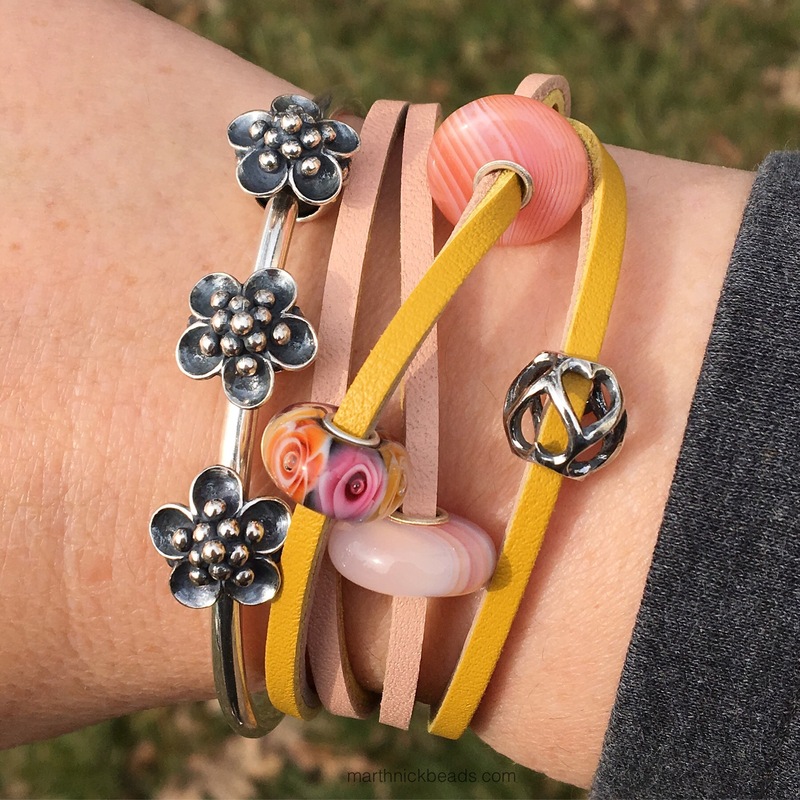 I love the combination with your yellow and pink bracelet and the Pink Stripe Agate beads. ( more things for ‘the list’). There is so much going on with this bead, I personally don’t think I would put too many others with it. Hi again Martha, I just wanted to tell you I was looking on Instagram at your photos when I happened to notice a wonderful palm tree dangle that you’re wearing. Just when I think I’ve got it under control!!! Oh my goodness, isn’t that wonderful? I had wanted it for years so finally bought it. Hey, what’s your Instagram name so I can follow you? I don’t actually have an Instagram name because I’m not very good with social media. I’m definitely not computer savvy! I just look at the photos, but of course I can’t comment. Ah! Well do let me know if you ever join! Love love love this bead. Ordered more than one-who knows with the supply issues if I will get them, but I didn’t want to take a chance. I love color and agree this will look so nice with a simple setting or with other solids. Beautiful photos and combination ideas as usual!! Thanks Tanya! I look forward to seeing what you do with it (them). I so regret not getting the one from a couple years back, as do some other people I think. Hope you get yours soon! 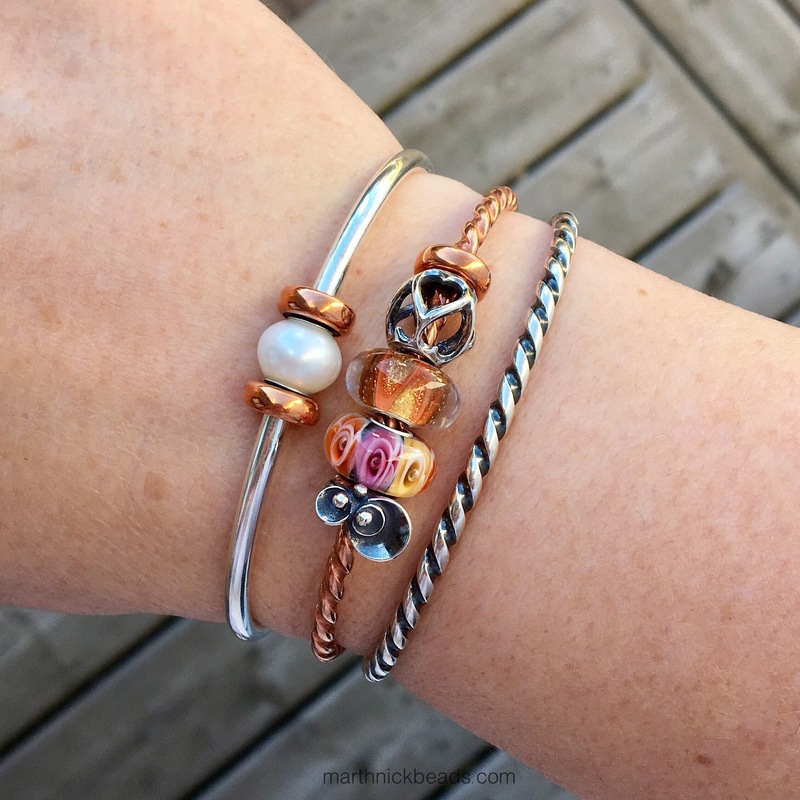 Beautiful bracelet designs as always, Martha! I really need to get Opposites Attract even though I’m not normally a heart person. It looks so cool every way you’ve shown it! I am a fan of Prisms as well; love their shape and size. I have lavender and purple in my collection and would also welcome a grey one. Dawn, lavender and purple prisms sound divine. There are just too many pretty beads! I should have tried Opposites Attract as a splitter on a Fantasy Necklace. 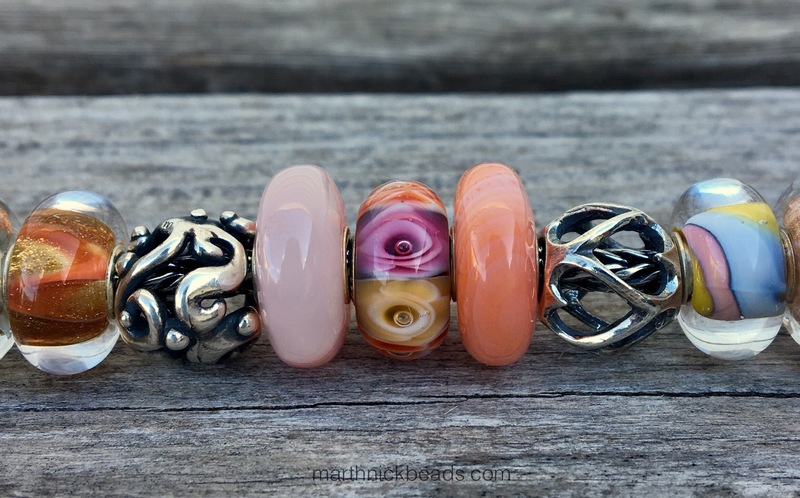 Trollbeads Cambridge just posted a photo of it and it looks lovely! I think it’s a very modern looking silver bead. Have a great weekend! 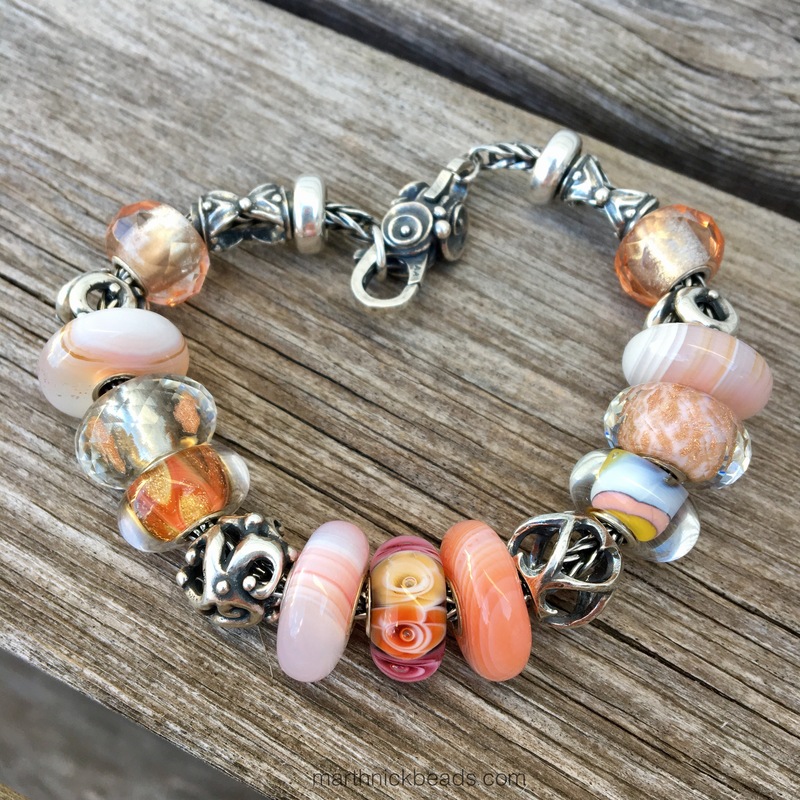 I just LOVE the full bracelet with the pink agate! So so pretty for Mother’s Day! Hi Carol! How nice to be able to choose among six beads! I just saw it on IG and think it’s lovely. I hear you about the bead from 2015. I so regret not buying it!